Do you know where your fuel for your vehicle comes from? Or the pros and cons of getting this fuel? I’ve recently had the pleasure of working with Mother Jones – a magazine publication that features issue on politics, the environment and human rights stories. 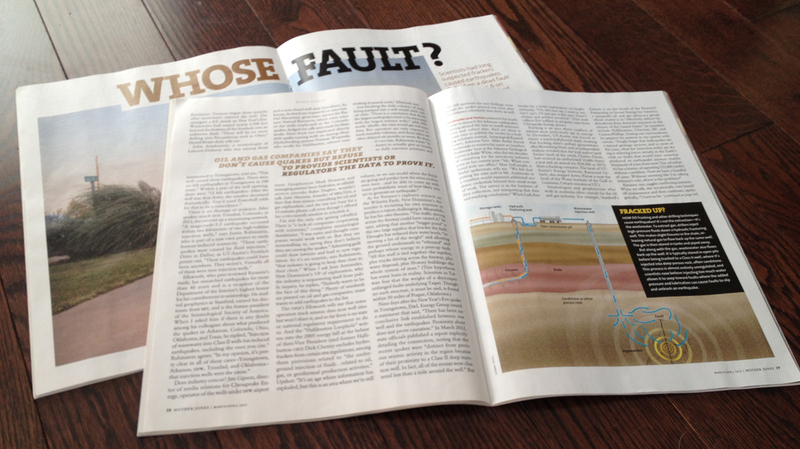 The article titled Whose Fault reviews the process of hydraulic fracturing (a.k.a. fracking) and how both scientists and oil or gas companies are on both sides of this debate: Does fracking and other drilling techniques cause earthquakes? Scientific evidence seems to prove it does, however oil and gas companies argue that sentiment without providing the appropriate statistical data to prove their argument. Mother Jones – Whose Fault? 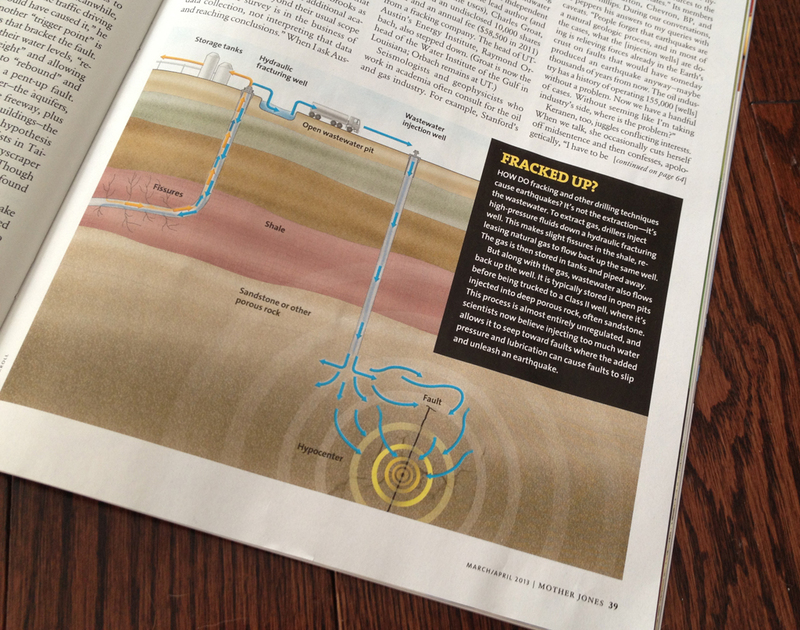 The illustration was to show the process of fracking through to how it could cause an earthquake, in one simple visual. In order to extract gas from the earth, drillers push high-pressure fluids down the hydraulic fracturing wells. Both gas and wastewater return out of the well. The wastewater is the key ingredient here. It ends up sitting in a waste water pit for a while, then is shipped off to be disposed of by getting pushed down a wastewater well and into rock such as sandstone. It is the pressure of the waste water that potentially effects a fault line, causing it to slip and eventually the possibility of an earthquake. It was great working on the challenges of this illustration, which were including a large amount of process into a little space, as well as having various things happening at one time and creating a simple visual to show all of that. The balance was in the simplicity of the illustration. The fracking issue shows an interesting indication of how we as a society care about the short term positives (getting fuel from the earth for our consumption), while not assessing the long term risks (natural disasters by earthquake). We are our own worst enemies. It was a pleasure working with Carolyn on this illustration! To read the full article and to understand both sides of this issue, pick up your copy of Mother Jones magazine today. NextWhy hire a Technical Illustrator?